I'm not going to dwell on what could have been anymore this year. It's been a fun ride, going back to last year's playoff run (that finished with our ESPN Zone tour), to winning the Presiden't Trophy this year and going to the East Finals again. I finally got to go to a game in the Eastern Conference Finals, and it was fun to be there, even though they lost. Seeing Briere score with 5.8 seconds left in the third to force OT is one of my favorite Sabres moments of all time now. Hopefully the majority of the team comes back next year, but who knows. We'll just have to wait til this summer to see if they can work a miracle to keep both Drury and Briere. I'll just end this with a couple of pics of the save Ryan Miller made on Jason Spezza in OT of Game 5. 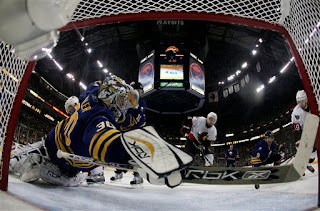 If the Sabres had won and moved on to the Stanley Cup Finals, this probably would have been Miller's save of the year. Instead, it was just another highlight reel save to add to his collection.